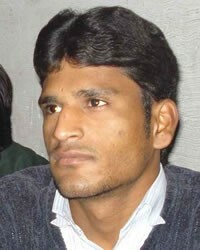 The Khatri are a trading and business caste, which originated in Punjab. Their name comes from the Sanskrit word "Kshatriya" which is the second of the four castes of Hinduism. In the early 19th century, they almost had a monopoly on trade in Punjab and Afghanistan. During the British times, they were the chief civil administrators. Traditionally, they specialized in trading in cloth but now have expanded to spectacles, flour grinding mills, grain shops and work as painters and tailors. Many members belong to the middle class and have entered teaching and civil service professions. They are found largely in Punjab of India and Pakistan but little known outside Punjab. They are one of the most advanced and progressive communities in India and value education. They will only eat food cooked by Brahmins or caste members. They have a legend that when Parasurama (the sixth Avatar of Vishnu) was engaged in subduing the Kshatriyas in the interests of the Brahmins, he caused as many Kshatriya women as possible to have violent miscarriages. Some pregnant Kshatriya women took refuge with Saraswat Brahmin families who protected them to the point of eating with them to show Parasurama that they were Brahmin women. The children born of these women became the Khatri. Saraswat Brahmins and Khatris still eat together giving credence to this story. Another more recent legend, has Khatris serving as soldiers in the Dakshin wars over a thousand years ago. Many died in the war and out of pity the council of the most respected Khatri in Delhi proposed widow remarriage. The clan headmen Lallu and Jaghdar opposed the concept and the council dissolved without a decision. The Emperor dismissed Khatri soldiers from military service and asked them to take up being Dalals (brokers). They proved to be excellent soldiers and governors of many states. Men and women marry within the community. Earlier, child-marriage was practised but now adult marriage is the norm. The elders of the family negotiate marriage alliance. The giving of gifts is mutual. Adult marriages is the norm though child marriages used to be favoured. Divorce is traditionally not allowed, but due to modernization, divorce is allowed under extreme maladjustment. Both nuclear and extended family types are found. The elders command respect and authority while the younger members receive love and affection from elders. Their women have a reputation for outstanding beauty. Women generally wear sarees or salwar-khameez in the north. They are both vegetarian and non-vegetarian. Only men drink alcohol and smoke. Khatris take their religion seriously. They celebrate traditional Muslim, Hindu and Sikh festivals and fasts as applicable. Muslims will go to Masjid and for Haj pilgrimage. Sikhism was founded by Khatris and some of their well known leaders, Guru Nanak and Guru Govind, were Khatris. Hindu Khatri are staunch, practising Hindus. 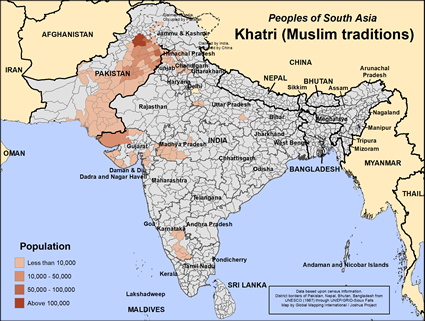 View Khatri (Muslim traditions) in all countries.